We are honored to present our first annual Vintage Kansas City Star Block of the Month. This is an exclusive Block of the Month that I put together for the Fat Quarter Shop. This all came about in a very unique way. I received a phone call in March from the owner of my local knitting shop. 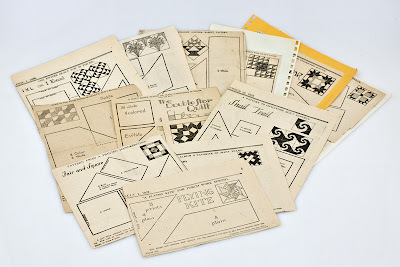 She told me someone had come by her shop with a box of 1930s quilt patterns, and she wondered if I would like to have them! I rushed to the shop as soon as I could and simply could not believe my eyes. 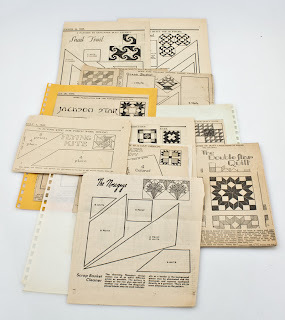 There sat a box containing hundreds of vintage quilt patterns from the Kansas City Star newspaper. The shop owner told me a man whose grandmother had recently passed away brought the patterns to her, because he just couldn’t imagine throwing them away and thought she might be able to find a good home for them. I was honestly in awe for days. I kept thinking about the man’s grandmother, and how she must have spent hours and hours saving these special patterns. I decided to create a block of the month quilt in her honor. First, I selected 12 of my favorite blocks, which would finish at 12”. Next, I chose the Cattails & Clover collection by Kansas Troubles Quilters and started sewing! This resulted in 12 wonderful blocks, perfect for any intermediate to advanced quilter. Each of our patterns includes the name of the pattern, author of the pattern, date the pattern was first published and a small excerpt from the newspaper. The blocks are all pieced (no templates, applique or paper piecing). This new Block of the Month begins in November 2011 and I would love for you to join us for this program!